Product prices and availability are accurate as of 2019-04-18 08:34:00 EDT and are subject to change. Any price and availability information displayed on http://www.amazon.com/ at the time of purchase will apply to the purchase of this product. Windows Server 2008 gives you the ability to deliver rich web-based experiences efficiently and effectively, with improved administration and diagnostics, development and application tools and lower infrastructure costs. With its built-in server virtualization technology, Windows Server 2008 enables you to reduce costs, increase hardware utilization, optimize your infrastructure, and improve server availability. 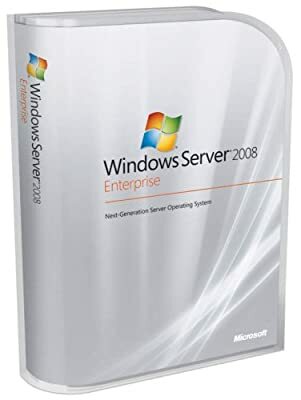 Microsoft Windows Server 2008 is the most advanced Windows Server operating system yet, designed to power the next-generation of networks, applications, and Web services. With Windows Server 2008 you can develop, deliver, and manage rich user experiences and applications, provide a secure network infrastructure, and increase technological efficiency and value within your organization. Internet Information Server IIS7 together with the .NET Framework 3.0 provide a comprehensive platform for building applications that connect users and data, enabling them to visualize, share, and act on information. Additionally, IIS7 plays a central role in unifying Microsoft's Web platform technologies--ASP.NET, Windows Communication Foundation Web services, and Windows SharePoint Services. Virtual Server's Virtual Machine Monitor provides the software infrastructure to create, manage and interact with virtual machines on multiprocessor hardware. Windows Server virtualization now provides the capability to allocate multiple CPU resources to a single virtual machine and enables virtualization of multithreaded applications. System Center Virtual Machine Manager focuses on unique requirements of virtual machines and is designed to enable increased physical server utilization, centralized management of virtual machine infrastructure and rapid provisioning of new virtual machines. Microsoft Windows Server Hyper-V, the next-generation hypervisor-based server virtualization technology, allows you to make the best use of your server hardware investments by consolidating multiple server roles as separate virtual machines running on a single physical machine. You can also efficiently run multiple operating systems--Windows, Linux and others--in parallel on a single server. With virtualization built into the Windows Server 2008 operating system and simple licensing policies, it's now easier than ever to take advantage of the cost savings of virtualization. Applications can also be efficiently virtualized using Windows Server 2008 centralized application access technologies. Terminal Services Gateway and Terminal Services RemoteApp allow easy remote access to standard Windows-based programs from anywhere by running them on a terminal server instead of directly on a client computer--without the need for a complicated VPN. Windows Server 2008 is the most secure Windows Server yet. The operating system has been hardened to protect against failure and several new technologies help prevent unauthorized connections to your networks, servers, data, and user accounts. Network Access Protection (NAP) helps ensure that computers that try to connect to your network comply with your organization's security policy. Technology integration and several enhancements make Active Directory services a potent unified and integrated Identify and Access (IDA) solution. And Read-Only Domain Controller (RODC) and BitLocker Drive Encryption allow you to more securely deploy your AD database at branch office locations. Finally, the new Server Core installation option of Windows Server 2008 allows for installation of server roles with only the necessary components and subsystems without a graphical user interface. Fewer roles and features means minimizing disk and service footprints while reducing attack surfaces. It also enables your IT staff to specialize according to the server roles they need to support. Microsoft Windows Server 2008 is the next generation of the Windows Server operating system that helps information technology (IT) professionals maximize control over their infrastructure while providing unprecedented availability and management capabilities, leading to a significantly more secure, reliable, and robust server environment than ever before. Windows Server 2008 delivers new value to organizations by ensuring all users regardless of location are able to get the full complement of services from the network. Windows Server 2008 also provides deep insight into the operating system and diagnostic capabilities to allow administrators to spend more time adding business value. Windows Server 2008 builds on the success and strengths of the award-winning Windows Server 2003 operating system and on the innovations delivered in Service Pack 1 and Windows Server 2003 R2. However, Windows Server 2008 is far more than a refinement of predecessor operating systems. Windows Server 2008 is designed to provide organizations with the most productive platform for powering applications, networks, and Web services from the workgroup to the datacenter with exciting, valuable new functionality and powerful improvements to the base operating system. In addition to new functionality, Windows Server 2008 provides powerful improvements to the base operating system over Windows Server 2003. Notable improvements include those to networking, advanced security features, remote application access, centralized server role management, performance and reliability monitoring tools, failover clustering, deployment, and the file system. These improvements and many others help organizations maximize the flexibility, availability, and control of their servers. Windows Server 2008 gives you the ability to deliver rich web-based experiences efficiently and effectively, with improved administration and diagnostics, development and application tools, and lower infrastructure costs. Simplified Web server management with Internet Information Services 7.0, which is a powerful Web platform for applications and services. This modular platform provides a simplified, task-based management interface, greater cross-site control, security enhancements, and integrated health management for Web services. Task based interface simplifies common management Web server tasks. Cross-site copy allows you to easily copy Web site settings across multiple Web servers without additional configuration. Delegated administration of applications and sites so you can give control to different parts of the Web server to those who need it. Deliver flexible and comprehensive applications that connect users to each other and their data, enabling them to visualize, share, and act on information. The Initial Configuration Tasks window opens automatically after the operating system installation process is complete, and helps the administrator finish the setup and initial configuration of a new server. Server Manager in Windows Server 2008 provides a single source for managing a serverÕs identity and system information, displaying server status, identifying problems with server role configuration, and managing all roles installed on the server. 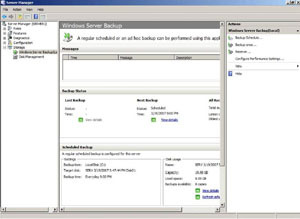 The Backup feature in Windows Server 2008 provides a basic backup and recovery solution for the server it is installed on. Built-in virtualization to virtualize multiple operating systems--Windows, Linux and others--on a single server. With virtualization built into the operating system and with simpler, more flexible licensing policies, it's now easier than ever to take advantage of all the benefits and cost savings of virtualization. Increased control over your user settings with Expanded Group Policy. Internet Information Services 7.0: Windows Server 2008 delivers a unified platform for Web publishing that integrates Internet Information Services (IIS) 7.0, ASP.NET, Windows Communication Foundation, Windows Workflow Foundation, and Windows SharePoint Services 3.0. IIS 7.0 is a major enhancement to the existing Windows Web server and plays a central role in integrating Web platform technologies. IIS 7.0 helps developers and administrators alike maximize their control over network/Internet interfaces through key functionality pillars that include delegated administration, enhanced security and a reduced attack surface area, integrated application and health management for Web services, and improved administration tools. Terminal Services: Windows Server 2008 introduces new functionality in Terminal Services to connect to remote computers and applications. Terminal Services RemoteApp completely integrates applications running on a terminal server with users' desktops such that they behave as if they were running on an individual user's local computer; users can run programs from a remote location side-by-side with their local programs. Terminal Services Web Access permits this same flexibility of remote application access via Web browser, granting an even wider variety of ways user can access and use programs executing on a terminal server. These features in conjunction with Terminal Services Gateway allow users to access remote desktops and remote applications via HTTPS in a firewall-friendly manner. Network Access Protection (NAP): A new framework that allows an IT administrator to define health requirements for the network and to restrict computers that do not meet these requirements from communicating with the network. NAP enforces administrator-defined policies that describe the health requirements for the given organization. For example, health requirements may be defined to include all updates to the operating system be installed, or having antivirus or antispyware software installed and updated. In this way, network administrators can define the baseline level of protection all computers carry when connecting to the network. Microsoft BitLocker provides additional security for your data through full volume encryption on multiple drives, even when the system is in unauthorized hands or running a different operating system time, data, and control. Read-Only Domain Controller (RODC): A new type of domain controller configuration in the Windows Server 2008 operating system that makes it possible for organizations to easily deploy a domain controller in locations where the physical security of a domain controller cannot be guaranteed. An RODC hosts a read-only replica of the Active Directory directory services database for a given domain. Prior to this release, users who had to authenticate with a domain controller, but were in a branch office that could not provide adequate physical security for a domain controller, had to authenticate over a wide area network (WAN). In many cases, this was not an efficient solution. By placing a read-only Active Directory database replica closer to branch users, these users can benefit from faster logon times and more efficient access to authentication resources on the network, even in environments with inadequate physical security to deploy a traditional domain controller. Failover Clustering: Improvements are aimed to makes it easier to configure server clusters while providing protection and availability of your data and applications. By using the new Validate Tool in failover clusters, you can perform tests to determine whether your system, storage, and network configuration is suitable for a cluster. With failover clusters in Windows Server 2008, administrators can carry out setup and migration tasks, as well as management and operations tasks more easily. Improvements to the cluster infrastructure help administrators maximize availability of the services they provide to users, achieve better storage and network performance and improve security. Windows Server 2008 Hyper-V is the hypervisor-based virtualization feature included as a role of Windows Server 2008. It contains everything needed to support machine virtualization. Hyper-V enables IT organizations to reduce costs, to improve server utilization and to create a more-dynamic IT infrastructure. Hyper-V provides the greater flexibility because of dynamic, reliable and scalable platform capabilities combined with a single set of integrated management tools to manage both physical and virtual resources, which enables you to create an agile and dynamic datacenter and progress toward achieving self-managing dynamic systems. In addition to Hyper-V, Microsoft is also releasing Microsoft Hyper-V Server. Microsoft Hyper-V Server provides a simplified, reliable, cost-effective and optimized virtualization solution enabling customers to reduce costs, to improve server utilization and to provision new servers rapidly. Microsoft Hyper-V Server easily plugs into customers' IT infrastructures as they can leverage their existing management tools and IT professional skill set with broad support from Microsoft and its partners. Hyper-V, the next-generation hypervisor-based server virtualization technology in Windows Server 2008, helps address many virtualization business challenges. You can now create virtual machines that can leverage available hardware, run multiple operating systems, and manage both virtual and physical resources using the same industry-standard tools. Memory support: Support for large memory allocation per virtual machine enables you to now virtualize most workloads, making Hyper-V an ideal platform for both enterprises and small to medium businesses alike. Improved storage access: With pass-through disk access and broad support for SAN and internal disk access, Hyper-V provides greater flexibility in configuring and utilizing storage environments optimally. Network load balancing: With the new virtual service provider/virtual service client (VSP/VSC) architecture, Hyper-V provides improved performance and utilization of core resources such as disk, networking, video, etc. New hardware sharing architecture: With the new virtual service provider/virtual service client (VSP/VSC) architecture, Hyper-V provides improved access and utilization of core resources such as disk, networking, video, etc. Quick migration: Hyper-V enables you to rapidly migrate a running virtual machine from one physical host system to another with minimal downtime, leveraging familiar high-availability capabilities of Windows Server and System Center management tools. Linux integration components: Beta Linux integration components are now available for SUSE Linux Enterprise Server 10 SP1 x86 and x64 Editions. These integration components enable Xen-enabled Linux to take advantage of the VSP/VSC architecture and provide improved performance. Beta Linux Integration components are available for immediate download through connect.microsoft.com. Scalability: With support for multiple processors and cores at the host level and improved memory access within virtual machines, you can now vertically scale your virtualization environment to support a large number of virtual machines within a given host and continue to leverage quick migration for scalability across multiple hosts. Extensible: Standards-based Windows Management Instrumentation (WMI) interfaces and APIs in Hyper-V enable independent software vendors and developers to quickly build custom tools, utilities, and enhancements for the virtualization platform. Server Core: Beginning with the Beta 2 release of Windows Server 2008, administrators can choose to install Windows Server with only the services required to perform the DHCP, DNS, file server, or domain controller roles. This new installation option will not install non-essential services and applications and will provide base server functionality without any extra overhead. While the Server Core installation option is a fully functioning mode of the operating system supporting one of the designate roles, it does not include the server graphic user interface (GUI). Because Server Core installations include only what is required for the designated roles, a Server Core installation will typically require less maintenance and fewer updates as there are fewer components to manage. In other words, since there are fewer programs and components installed and running on the server, there are fewer attack vectors exposed to the network, resulting in a reduced attack surface. If a security flaw or vulnerability is discovered in a component that is not installed, a patch is not required. Windows PowerShell: A new command-line shell with over 130 tools and an integrated scripting language. It enables administrator to more easily control and securely automate routine system administration tasks, especially across multiple servers. Windows PowerShell does not require you to migrate your existing scripts, and it is ideally suited for automation of new Windows Server 2008 features. A new admin-focused scripting language, and consistent syntax and utilities, Windows PowerShell accelerates automation of system administration tasks--such as Active Directory, Terminal Server, and Internet Information Server (IIS) 7.0--and improves your organization's ability to address the unique system management problems of your environment. Windows PowerShell is easy to adopt, learn, and use, because it does not require a background in programming, and it works with your existing IT infrastructure, existing scripts, and existing command-line tools. 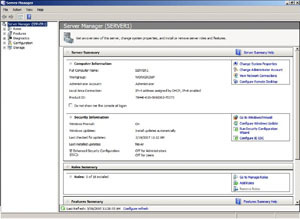 Server Manager: A new feature that is included in Windows Server 2008. It is a "one-stop-shop" designed to guide Information Technology administrators through the end-to-end process of installing, configuring, and managing server roles and features that are part of Windows Server 2008. Server Manager replaces and consolidates a number of features from Microsoft Windows Server 2003 such as Manage Your Server, Configure Your Server, and Add or Remove Windows Components. You can use Server Manager to configure various "roles" and "features" on your machine. Windows Deployment Services (WDS): An updated and redesigned Windows Server 2008 version of Remote Installation Services (RIS), WDS assists with the rapid adoption and deployment of image-based Windows operating systems. 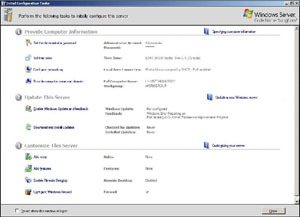 WDS allows network-based installation of Windows Vista and Windows Server 2008 to "bare metal" computers (no operating system installed), and even supports mixed environments including Microsoft Windows XP and Microsoft Windows Server 2003. Windows Deployment Services thus provides an end-to-end solution for deployment of Windows operating systems to client and server computers and reduces the total cost of ownership (TCO) and complexity of Windows Server 2008 and Windows Vista deployments. Windows Vista and Windows Server 2008 originally began as part of a single development project, and as such they share a number of new technologies across networking, storage, security and management. Although the development of Windows Vista and Windows Server 2008 have branched into separate releases with different release cycles, many of these enhancements apply to both Windows Vista and Windows Server 2008. When organizations deploy both operating systems, they will see how the combined client-server infrastructure provides even greater advantages. IT professionals who are administering a Windows Vista / Windows Server 2008 infrastructure will notice many improvements in how they control and manage their environment. Maintenance is greatly simplified by the use of a single model for updates and service packs across client and server. 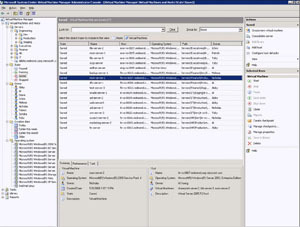 Client computers can monitor for specific events and forward to Windows Server 2008 for centralized monitoring and reporting. Windows Deployment Services provides much faster and more reliable operating system deployment. Network Access Protection features on Windows Server 2008 ensure that Windows Vista clients connecting to the network are compliant with security policies and restricted from accessing network resources if not. The reliability, scalability, and overall responsiveness of the infrastructure are greatly increased by improvements made to both Windows Vista and Windows Server 2008. Clients can render print jobs locally before sending them to print servers to reduce the load on the server and increase its availability. Server resources are cached locally so that they are available even if the server is not, with copies automatically updating when the client and server are reconnected. Applications or scripts that need to run on both client and server can take advantage of the Transactional File System to reduce the risk of error during file and registry operations and roll back to a known good state in the event of failure or cancellation. Policies can be created to ensure greater Quality of Service for certain applications or services that require prioritization of network bandwidth between client and server. Windows Vista clients connecting to networks where Windows Server 2008 has been deployed can experience greatly improved communication speeds and reliability. Searching Windows Server 2008 servers from a Windows Vista client avails of enhanced indexing and caching technologies on both to provide huge performance gains across the enterprise. Native IPv6 support across all client and server services creates a more scalable and reliable network, while the rewritten TCP/IP stack makes network communication much faster and more efficient. The new Server Message Block 2.0 protocol provides a number of communication enhancements, including greater performance when connecting to file shares over high-latency links and better security through the use of mutual authentication and message signing. Terminal Services on Windows Server 2008 have many improvements, including providing Windows Vista clients with remote access to internal resources through an HTTP gateway and seamless remote applications that run as if on the local desktop.